TOKYO, Japan, April 11, 2011 (ENS) – One month ago today, a massive 9.0 magnitude earthquake and tsunami devastated northeastern Japan, claiming an estimated 28,000 lives and triggering a nuclear emergency at the Fukushima Daiichi nuclear power plant that has released radiation into air, sea and soil. Workers fought a fire at the crippled nuclear plant on Tuesday as yet another big aftershock hit northeastern Japan, shaking Tokyo buildings and temporarily closing runways at Narita airport. The fire erupted moments after a 6.3 aftershock struck off the coast of Chiba prefecture, 77 kilometers (48 miles) northwest of Tokyo. The fire broke out at the sampling building near a water outlet at reactor Unit 4 but was soon extinguished. There was no change in the levels of radiation around the power plant, 240 km (150 miles) north of Tokyo, said operator Tokyo Electric Power Co. Since March 11, hundreds of aftershocks have rocked the same area. Another severe aftershock, measuring a 6.6 magnitude struck on Monday at 5:16 pm, local time. Two people died and three others were injured said police. Two others are missing and unaccounted for. In a 7.1 magnitude quake on April 7, four people died and more than 100 were injured. The Japan Meteorological Agency warns that further aftershocks with magnitudes greater than 6.0 are expected. In Monday’s quake, off-site power to the Fukushima Daiichi power plant was again lost and water injection pumps for reactor Units 1, 2 and 3 stopped. Japan’s nuclear safety agency has confirmed that off-site power was restored and water injection resumed 50 minutes after the earthquake. Overall, the situation at the Fukushima Daiichi plant remains “very serious” but there are early signs of recovery in some functions such as electrical power and instrumentation, according to the International Atomic Energy Agency. The risk of a huge radiation leak is lower, but the danger is far from over, nuclear experts say. In reactor Units 1, 2 and 3, some 60,000 tons of contaminated water must be removed from the turbine buildings and trenches. This water will be transferred to the condensers of each unit and the Radioactive Waste Treatment facility, the IAEA said. In addition, temporary storage tanks have been ordered to provide additional capacity for the water and will be located adjacent to the Radioactive Waste Treatment facility. At Unit 1 and 2 water transfer from the condenser to the condensate storage tank was completed on Sunday. In order to make room for higher contaminated water from the turbine buildings and trenches, about 10,340 tons of low level contaminated water were released to the sea from April 4 to 9 over the objections of Japanese commercial fishermen and neighboring countries. Nitrogen gas is being injected into the Unit 1 containment vessel to reduce the possibility of a hydrogen explosion within the containment vessel. The pressure in this containment vessel is increasing due to the addition of nitrogen, indicating success of the operation. 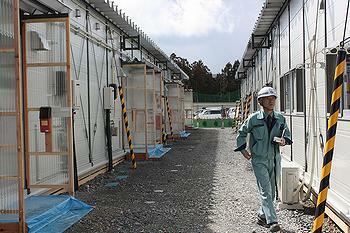 Since April 6, TEPCO has been moving debris from Units 1 to 4 to a common storage area on-site using remote controlled heavy equipment. A resin has been sprayed across the site to prevent radioactive materials on the ground from being scattered. Still, radiation is spreading from the damaged power plant. The Japanese government has expanded its current 20-kilometer (12 mile) evacuation zone around the Fukushima Daiichi nuclear power plant due to the risks posed by long-term radiation exposure. The expanded zone between 20 and 30 kilometers around the power plant includes Katsurao Village, Namie Town, Iitate Village and some parts of Kawamata Town and Minami Soma City. Residents in the expanded zone have been asked to evacuate within 30 days, Chief Cabinet Secretary Yukio Edano told reporters Monday. The top government spokesman said annual exposure in the evacuation zone is expected to be above 20 millisieverts, about 10 times the worldwide average annual exposure from natural background radiation. Edano urged that children, pregnant women, nursing care patients and hospital patients stay away from the areas, adding that kindergartens, elementary and junior high schools in the area will remain closed. Today, some 150,000 people are still in evacuation shelters, down from about 450,000 several weeks ago. With help from the Japanese Red Cross and other aid organizations, the Japanese government is building 70,000 homes to ease the pressure on evacuation centers and return survivors to a semblance of normality. Edano said he has told the public and his family “exactly the same thing” about levels of radiation released by explosions and leaks at Fukushima Daiichi into the environment, food and water. But long-term exposure to radiation has harmful effects on child development. Radiation can induce cancers that appear years after an adult is exposed. The cancers most commonly linked with radiation are leukemia and cancers of the thyroid, lung, and breast. 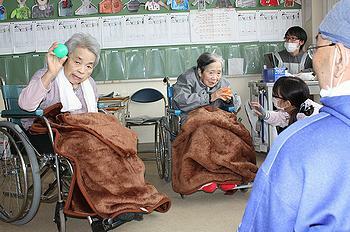 In addition, the cells of elderly people may have reduced ability to repair damage from radiation. As a result of the March 11 quake and tsunami, followed by a magnitude 7.0 quake on April 7 that cut off power to Tohoku Electric’s Onagawa nuclear power plant, a total of 158,392 households in the northern part of Honshu island were without electricity Sunday, said Tohoku officials. 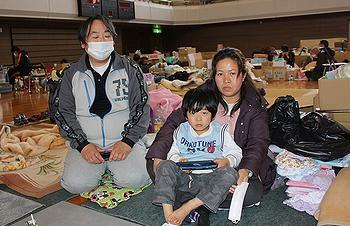 At least 210,000 households in 10 prefectures were without running water as of early Saturday, the Health Ministry said. Tokyo Electric President Masataka Shimizu visited the Fukushima government on Monday apologized for the nuclear accident. Shimizu apologized to people in and outside Fukushima Prefecture, saying his company has added to their physical and mental burdens with the nuclear crisis. He said TEPCO will do its utmost to compensate them financially. Compensation will be based on the government’s guidelines, after they are issued. 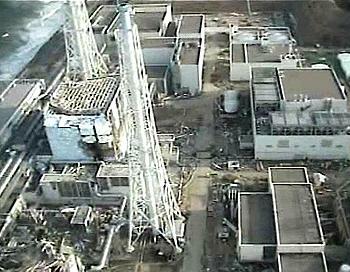 Shimizu said he expects the four damaged reactors at the power plant to be decommissioned. Fukushima Governor Yuhei Sato has refused Shimizu’s request to meet and declined to receive an apology directly.